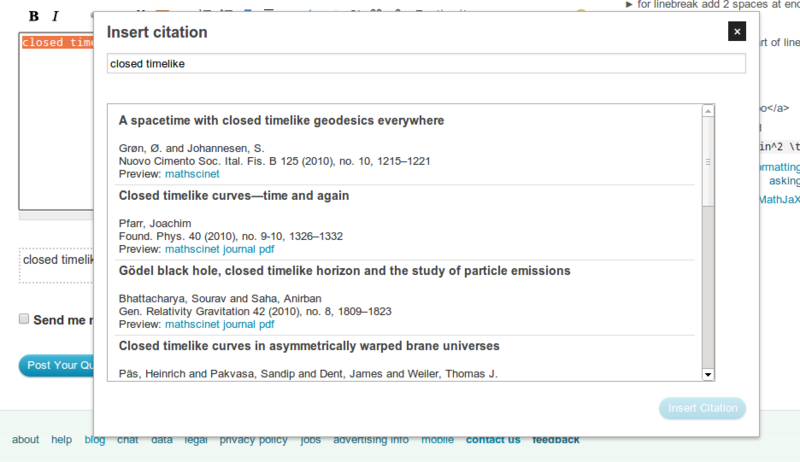 We'd like to make it easier to cite articles from the literature, on MathOverflow. I propose adding a single button to the edit toolbar while writing posts, which will pop up a search dialog, allow the user to select a result, and then insert a nicely formatted link to the paper back into the edit box. <span class="citation" authors="Sendak, Maureen and Geisel, Theresa" mrnumber="MR1234567"
which will render simply as the hyperlink A mathematics paper. The hyperlink should be the 'best available URL', e.g. the DOI resolution address, a direct link to the published version, or the link to the corresponding record on MathSciNet. 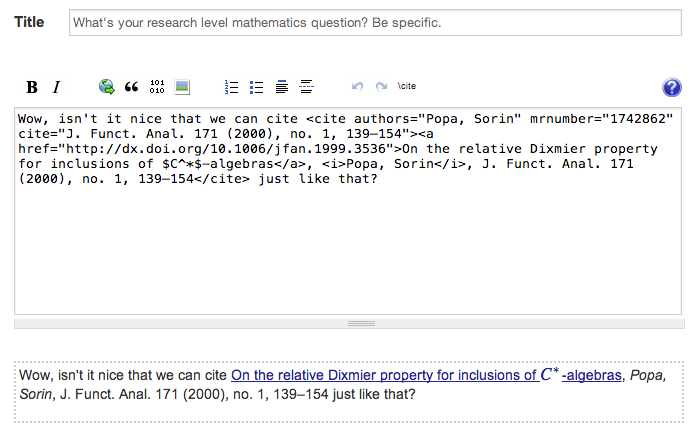 it allows us to programmatically detect and reformat citation links after the fact, if desired (e.g. to provide links to your local library's resolver). 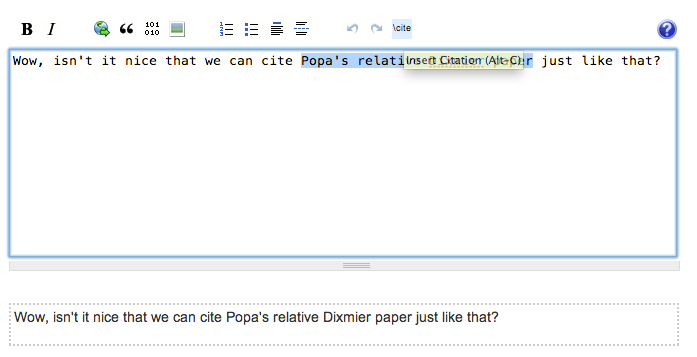 We now have a prototype for inserting citations! See it in action in this video tutorial. It currently requires you to install a user script, and has only been tested on the Chrome browser. To get started, open Chrome, and click on this link to download the user script. Once you've downloaded it, go to the "Window" menu in Chrome and select "Extensions". Drag and drop the downloaded user script file into the Extensions tab, and click "Add". Now, visit MathOverflow and start asking a new question (or starting answering an existing question). You'll see at the top of the edit box there's a button labelled \cite. Click this, and a search dialog will pop up. (If you've selected text in the edit window, this will automatically be copied into the search dialog.) 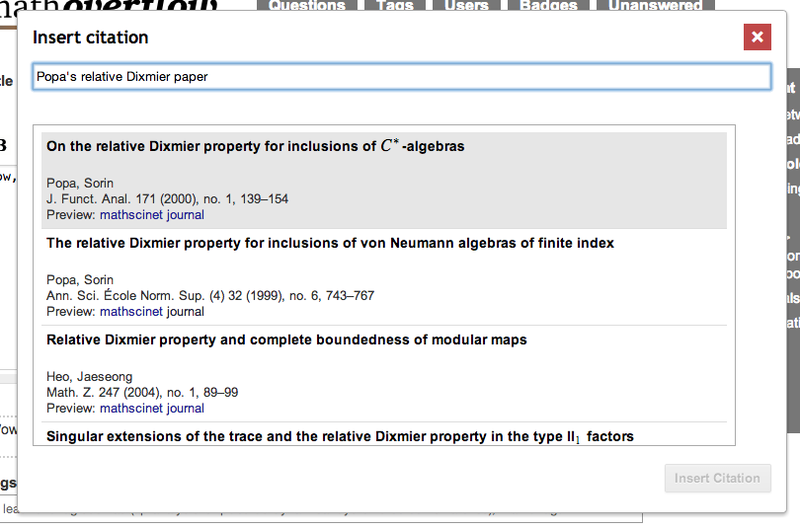 The search dialog accepts titles, authors, and citation data in any combination. You'll see one or more best matches, and often a preview of the PDF in the right pane. If you see what you want, select it in the left pane, and a nicely formatted citation will be inserted back in the edit box! Here are some screenshots of the script in action. Seems like a very useful feature to me. I am not an expert on HTML and co; but wouldn't the cite element be more appropriate than a general span tag? As far as I know, you can still use all the other attributes that you were already using. The benefit would be a more semantic markup, which is good for SEO, and for custom stylesheets of users (or say specific browsers). Not the answer you're looking for? 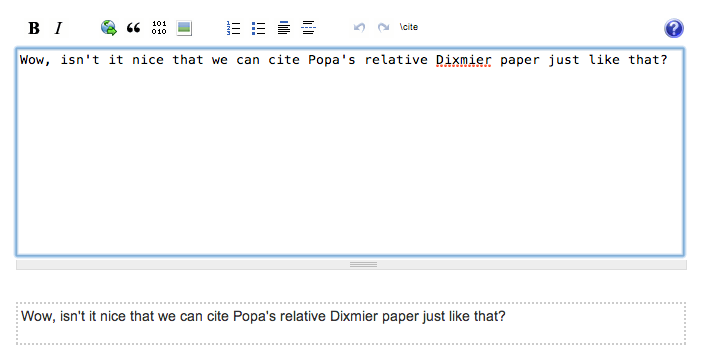 Browse other questions tagged discussion user-interface citations .